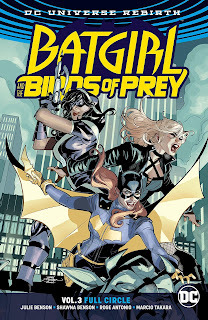 The Rebirth Batgirl and the Birds of Prey Vol. 3: Full Circle addresses many of my concerns about the previous book -- the stakes are higher, the conflicts more personal, there's some real danger within the pages. At the same time, the book still feels soft to me -- perhaps due to its jokey aesthetic, one knows better than normal here that nothing really bad will happen to the principals, and the book is overwritten to the point where the story drags at times. I'd call this a mild trend up for this series if it wasn't the last volume; in that respect, this is an OK enough conclusion insofar as what this book has been capable of, but I'm hopeful DC's will take another run at Birds of Prey some time with more oomph behind it. Collecting the entire end of this run by Julie and Shawna Benson, Full Circle includes nine issues — the three-part "Manslaughter," the four-part "Full Circle," and two one-shots before and between those respectively. "Manslaughter" brings together heroines from across the DC Universe (similar to other stories at the ends of previous Birds of Prey runs), while "Full Circle" ties up many of the title's remaining plot threads as the Birds go up against the Calculator again. The thing about the writers' Birds of Prey is that it's rarely poor outright; the first part of "Manslaughter," for instance, has Barbara Gordon palling around with Lois Lane, rare extra-title references to the Batman/Catwoman relationship, Amanda Waller, Batwoman and the Gotham Knights, even a Wonder Woman cameo. But it's also a book that plods along -- that first "Manslaughter" issue offer a six-page sequence of each of the Birds finding out about the contagion threat du jour separately and then together, four pages of the Birds and their allies chatting about it, multiple pages of the Birds chasing red herrings, and so on. Interesting things happen, but often the audience is well ahead of the story by the time it gets there. And Source Code as a whole has a variety of other foibles. The culprits in "Manslaughter" turn out to be regular people, but nonsensically Wonder Woman is unable fight them off herself for the writers' needs for the story. The Birds have a team cheer at the end of "Manslaughter" in which the writers have the stoic Huntress shout, "Yeeaaah!" There's quotes from songs and movies peppered throughout as if they were original dialogue. For a book with themes of female empowerment, "Manslaughter" has an apologetic conclusion that seems an ill fit for this title. Black Canary cuts herself on a mirror and bleeds profusely with no consequence. Batgirl displays the superhuman ability to knock a bullet out of midair. New Oracle Gus Yale's final present to the Birds, a repository of Birds memorabilia, is almost entirely devoid of Easter eggs for the audience. The result of all of this is a book with good intentions but that feels strongly in need of polish. Of the two main stories, "Full Circle" is stronger in that it kicks off with Gus's shocking death. Killing off a character named for the late Kim Yale, one of Oracle's creators, is another of this book's questionable decisions, but at least it gives the story some heft. From there the writers pivot to bringing in Huntress' mother, again involving the Birds personally in the way earlier stories haven't. Much of it is altogether silly, between the Calculator (who could be as frightening as Arrow's Ricardo Diaz, but isn't) and his hulking robot "Burnrate," but at least the characters are affected. The tension leading up to Batgirl losing her cool and revealing her Oracle identity to Calculator is palpable; there's a predictable Spartacus bit after that, but at least the writers get us emotionally in line with the characters at their moment of crisis. The difficulty with Batgirl and the Birds of Prey Vol. 3: Full Circle is assuredly in the details. Of the two single issues, one sees Canary Dinah Lance accompany Huntress Helena Bertinelli on a field trip for Helena's school class; the writers' warm, fuzzy Helena seems off, more the pre-Flashpoint Helena than the New 52 Spyral's Matron. In the other, at least the Birds decamp to Paris, but what's meant to be comedy is at best smirk-inducing. Neither, however, recognizably move forward the book's subplots in any significant way; neither changes any of the characters between beginning and end. Given that, and devoid of real humor or suspense, one becomes unsure what you're here for. Green Arrow under Benjamin Percy has been one of the best books of Rebirth and frankly I'm concerned about these writers taking over; hopefully lessons learned from Birds of Prey will be put into practice there. I don't know how Julie and Shawna Benson split up the writing between them, but I thought the book took such a quality tumble starting with the "Manslaughter" arc that it made me wonder if the sister who wrote most of the dialogue switched places with the other. Also, I really missed the funny captions from the first arc. Manslaughter really bothered me - seemed like they went out of their way to justify having a big all-woman team-up (instead of, you know, just having the people you want to team-up coincidentally all in the same place like every superhero team-up), then didn't have any big payoff for it (reminds me of the Batman/WW part of World's Finest in King's run where they went to the trouble of having WW around for the engagement, then nothing really came of it). Oh, well.